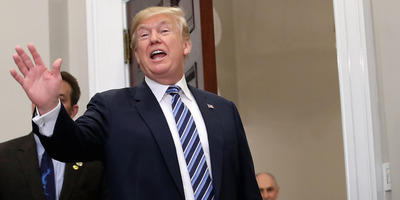 President Donald Trump waved off rumblings that the Republican party may be set to lose ground in the 2018 midterm elections. He brandished the GOP’s winning record in the House since he took office. But polling and electoral trends recently do not favour Trump. If Democrats win just 2 seats in 2018, the Republicans will be the minority in the Senate and Trump’s agenda will have even more trouble. President Donald Trump has waved off rumblings that the Republican party is set to lose seats in the House and Senate in 2018’s midterm elections. “Remember, Republicans are 5-0 in Congressional Races this year. The media refuses to mention this. I said Gillespie and Moore would lose (for very different reasons), and they did. I also predicted “I” would win. Republicans will do well in 2018, very well!” Trump tweeted on Monday morning. Trump brought up Ed Gillespie and Roy Moore, two Republicans who ran and lost during Trump’s presidency. Trump offered both his endorsements and support, but later said he had predicted their losses. In the case of Gillespie, Trump blamed his loss on a less-than-complete embrace of Trump’s policies. In the case of Moore, Trump had backed a different candidate from the start. But recent electoral and polling trends show that the support that helped Trump win his own election victory may be withering. Even Fox News viewers and voters in Alabama, a historically deep-red state, have demonstrated a diminishing view of the President. A Suffolk University poll this month found that Trump’s favorability rating among people who listed Fox News as their most trusted news source was 58% – down from June (90%) and October (74%). In Alabama exit polls after Doug Jones’ surprise victory earlier this month found just 48% of voters say they approve of Trump, and 48% say they disapprove. House and Senate Democrats appear to have made a coordinated effort to purge members of their party accused of sexual misconduct, while the Republican National Committee endorsed Moore, who stood accused of serious misconduct with minors. Additionally, the win in Alabama showed that Democrats can turn out the vote from black communities, especially black women, who overwhelmingly turned up at the polls to vote Democrat. In 2018, 34 Senate seats will be up for grabs in elections across the Country. Of those 34 seats, Democrats hold 26. If Democrats can turn over two seats, they will win the majority. Even with the Senate and House in his corner, Trump has struggled to deliver on major legislation, although his tax plan seems likely to pass.